In an evening of song, Kiran Young Wimberly and the McGraths will share music from their newest album of Celtic Psalms, as well as old favourites from previous albums. 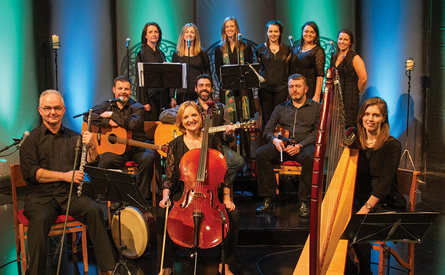 With soulful voices, rich harmonies and traditional instrumentation, these arrangements of psalms to Irish and Scottish melodies bring fresh life to ancient words. Kiran Young Wimberly, an American Presbyterian minister who has spent much of the past decade in Northern Ireland, and the McGrath family of Dungannon, Co. Tyrone, have shared their music with diverse communities here in Northern Ireland and abroad in North America. Their music has been featured on the BBC televised series “Then Sings My Soul,” as well as Sunday services with RTE and the BBC on radio and TV. Building bridges between traditional and sacred music, and tapping into some of deeper human emotions of joy and sorrow, lament and hope, this event is sure to be healing balm for the soul. Please visit www.celticpsalms.com for further information.